In late November, 29 students and 13 senior scientists gathered in Obergurgl, Austria, for the 5th HBP School on Brain Disease Neuroscience. This winter school delivered a unique overview of brain disease modeling across different pathologies, methods and levels, with a focus on the clinical impact of neuroscience. The School also emphasised student projects, interactions, participation and networking, stimulating bonds and synergies in an enthusiastic atmosphere. 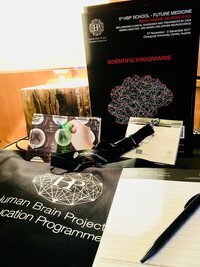 The School is an initiative of the Education Programme of the Human Brain Project (HBP) and in collaboration with The Medical Informatics Platform (MIP, HBP Subproject 8). The goal of the school was to give a broad view of the different approaches to brain-related diseases and to get the active involvement of the participants. The primary focus was on dementia and Alzheimer’s disease, epilepsy and strokes. These were investigated from the micro-circuit scale up to the phenotype and cognitive level, using EEG, MRI, Scores and other techniques. Above left, Alain Destexhe from EITN presenting about epilepsy through spikes observation at micro-circuit level, and above right Ana Solodkin from Irvine University in California lecturing on AD on large-scale brain network. “This winter school has assembled two communities that normally are separated: the community of clinicians and specialists of brain diseases, with theoreticians and computational neuroscientists interested in simulating the mechanisms of disease, from simple neural circuits to large-scale brain networks,” explained Alain Destexhe from CNRS, director of the European Institute for Theoretical Neuroscience in Paris, scientific committee member of the 5th HBP School and involved lecturer / mentor. Above left, Peter Taylor from Newcastle University in the UK talks macroscopic modelling and above right Mario Rosanova from Milano University talks brain injuries. The 5th HBP School also introduced week-long project sessions. Six subjects were chosen to be treated in greater depth during week-long afternoon sessions. Each afternoon, participants broke into small groups to explore these topics under the mentoring of the relevant lecturers. Using computational tools and models, data and biological biomarkers, the participants were able to come up with impressive results and conclusions on subjects such as disease progression prediction, seizure transition models or brain dynamics after certain types of lesion. On the last day, each group presented their outcomes in plenary talks of 45 minutes each. Above, left and right: Each group of students presented their conclusions in a 45 minute presentation in plenary sessions. A good exercise also to structure results and to work on public speaking skills. The aim of this kind of project sessions was to push the students to be actors, to work in teams and to interact more closely with senior scientists. They also got a much deeper look into concrete work and methods, thanks to the involvement of the tutors throughout the week. Lectures, hands-on, group projects, is that all? No, it was not: During the week, each participant also presented their current or previous work during a lightning talk and a related poster exhibit, which opened the door to great interactions among the participants and with the lecturers and senior scientists. “The interactions that were started in this school will undoubtedly lead to useful collaborations to better understand brain diseases,” Destexhe added. This year, the Best Poster prizes all went to… women scientists! Ada Johanne Ellingsrud from Oslo, Domantė Sakalauskaitė from Vilnius and Anja Kaja Ries from Munich. The School took place at the Obergurgl University Center of the University of Innsbruck, Austria. These premises also contributed to the success of the school, with lectures, breakout rooms, accommodation, and restaurant all on site. This strengthened the bonds, and helped stimulate the rich and essential conversations that made the week so successful. The venue is located on the ski slopes, which was an incredible opportunity to use the afternoon breaks for a little bit of fun exercise, whether it was on skis or in a guided snowshoe hike organised by the Education team. Following a complete week of advanced neuroscience can be demanding on neurons but nothing a good breath of mountain air can’t fix!